I love pasta and my family and I eat a lot of it. I especially like a good bolognese, however I am trying to add more non meat pasta sauces to my meal rotation. 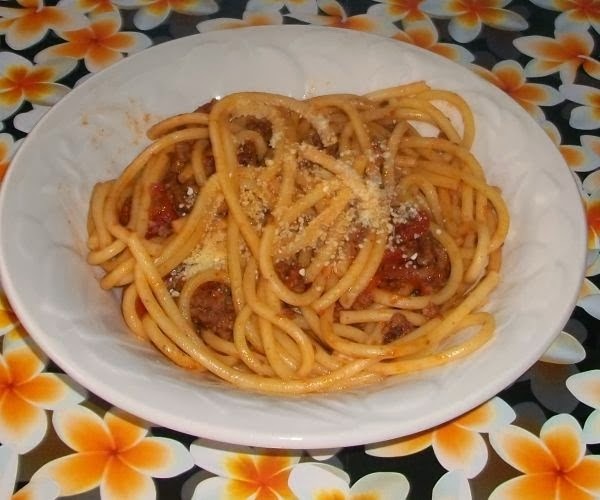 this dish is a basic bolognese served with bucatini pasta . I don't really follow recipes and all measures are a guide line only. fry onion until soft, add in garlic and stir until garlic starts to soften. add in beef and break up with a spoon, stir until browned, drain excess fat. add grated carrot and herbs, continue to stir. when meat is browned put in can tomatoes and tomato puree and let simmer on low approx 30-40 mins. put in tomato paste and simmer for 15 mins. meanwhile bring a large pot of salted water to the boil and cook pasta of choice according to packet directions. drain pasta and toss with sauce adding grated cheese if liked. I used bacatini pasta and can't say that I'd use it again as I found it rather too thick for my liking but the rest of the family had no such issues.